Photos taken by a Chesterfield man have been confirmed by the Department of Conservation to be a mountain lion. 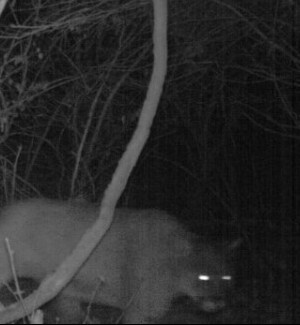 A mountain lion that is in the Chesterfield area near the Missouri River. The Department of Conservation would like to remind everyone that mountain lions are nocturnal and tend to avoid humans. Not to be confused with cougars, who just pretend they are nocturnal, hitting up college bars and then trying to take home Johnny Frat at 10:45 because they have a big meeting tomorrow. Beringer said mountain lions seen in Missouri are probably young males roaming from surrounding states, searching for new territory, usually along a river. Also that Chik-Fil-A in the Chesterfield Valley is pretty good, so he could be heading over there. If you want to be safe, stay near the Olive Garden. That place is horrible.